So, I'm a bad blogger but we've been in fast forward at the Hankins House! Hulse and Olivia are growing like weeds. 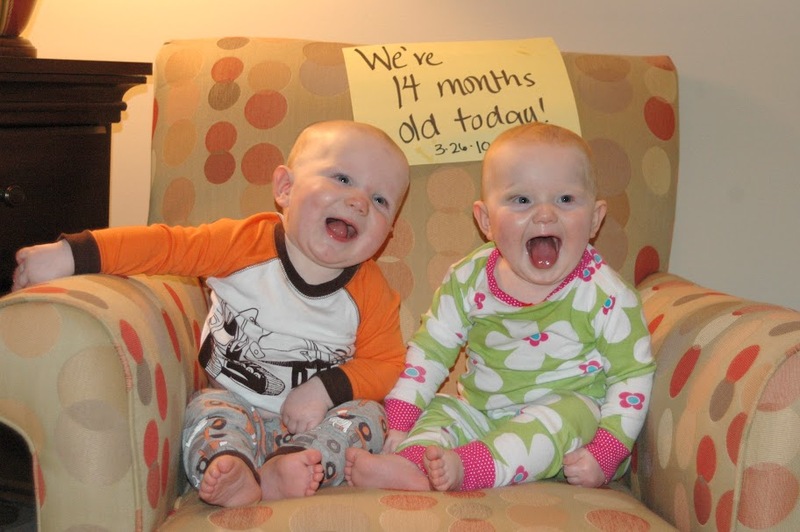 We went to the doctor today for their one year appointment (just a couple of months late!) and here are the stats from their visit. You're weighing in at 24 pounds 12 ounces (60th%) and are 30 inches long (25th%). You are turning into a very hilarious little man. You are so smart and love to talk. You are trying to repeat everything your Dad and I say. Your real words are: Dada, Mama, Papaw, Uh-oh, book, duck, bye, hi, ball and thank you. (There have even been reports of you saying "Wivia" and Cracker. We think we've heard a Wivia every once in a while, but we can't be certain.) You are a typical boy and play rough so you constantly look like a prize fighter, much to the dismay of your mom. You love to run around and play with your friends and with your sister. You are a great eater. There is really nothing that you don't like, except milk. You're not really into drinking your milk at meal time. You are a precious little boy and make your mom and dad laugh every day. We love you to the moon and back! 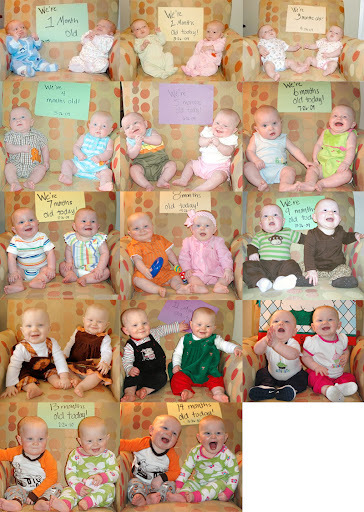 You are a whopping 23 pounds 5 ounces (75th%), and they measured you at the same 30 inches (50th%) - although we can see that your brother is slightly taller by 1/2 an in or more. You're a sweetie pie! You are all girl, until it comes time to wrestle with your brother and then you're in it to win it. You also love to talk but tend to stick to your own words. You do say dada, mama, uh-oh, and bye. You are also a really great eater but unlike your brother you LOVE your milk. You have no problem putting a sippy cup full of it away. You are our sweet baby girl and are a joy to your dad and I. We love you to the moon and back! Yes, we know they are wearing the same PJs. It wasn't intentional, and we even remembered before we took the 14-month picture. But we decided to go with it anyway. We could always add those pajamas to each picture during year two to see how long it takes before they literally burst out of them. More about what's been going on with us. . .
Olivia got her first black eye. This picture was taken the first night after she hit her head on a window sill at daycare. We'll try to find one from the last couple days where you can see it is now truly a "black" eye. Then, Sunday morning, Hulse turned mom's big stand-up jewelery case over directly onto the bridge of his nose.